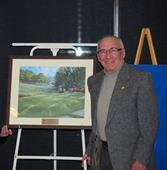 Don Forsyth of the Bel Acres G&CC is the second recipient of the annual Golf Manitoba Distinguished Service Award. Don has been involved as a volunteer with amateur golf since 1992 where he was a part of the first four person team to introduce course and slope rating in Manitoba and Northwest Ontario. In 1993 he had his first experience as a rules official at the Men’s Match Play Championship at the Wildewood Golf Club. He has continued as an active rules official to this day. He served on the Board of the Manitoba Golf Association and Golf Manitoba from 1998 to 2004 where he held the position as Officials Chair for the duration of his tenure. An accomplished player, Don has also been club champions at the Polo Park Golf Club, the Assiniboine Golf Club and the Breezy Bend Country Club. He was also crowned the provincial senior champion in 1988.